Moon River Nursing Careers offers training for careers in healthcare. Nurse Aide course: This requires a minimum of 120 hours and prepares the graduate to work as a CNA (Certified Nursing Assistant). This course includes classroom time, lab hours and a 40 hour clinical experience at a nursing home/rehabilitation center. An experienced instructor from Moon River Nursing Careers accompanies the students to the clinical site. 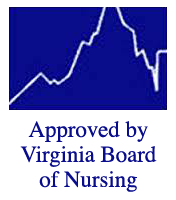 Upon completion of the course, our instructor registers each graduate to take the state written and practical exam administered by the Virginia Board of Nursing. A passing grade in both sections of the test will result in being licensed as a CNA in Virginia. There is a shortage of CNAs and and a wide range of options for employment. The CNA certication will open up opportunities to work in hospitals, nursing home/rehabilitation centers, memory care, clinics, physician’s offices and in Medicaid/Medicare/Private pay home health agencies. Many CNAs do this as a career and enjoy the flexibility to work in different healthcare settings. Others planning to attend nursing school or medical school find that working as a CNA provides valuable experience in patient care.